Award: "Won the European Fantastic Film Festival Federation (EFFFF) Asian Film Award at the 10th Puchon International Fantastic Film Festival"
“People try to frighten me with all kinds of stories about the Chinese Seventh Month. Scary stories about death, hell, and hungry ghosts. But I wasn’t scared. For me, this was something new”. 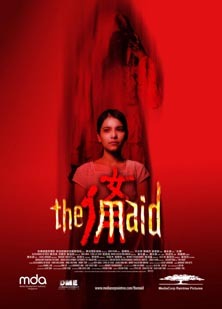 Billed on the DVD case as “Singapore’s First Homegrown Horror Movie”, 2005’s The Maid has quite a bit in common with other Asian horror films from this era, relating a ghost story that’s steeped in ancient tradition. But while director Kelvin Tong does manage to conjure up a few creepy scenes, it’s the mystery surrounding his characters, and the manner in which he builds that mystery, that makes The Maid an interesting watch. Rosa (Alessandra de Rossi), an eighteen year old girl from the Philippines, has just arrived in Singapore, where she’s accepted a position as maid for the Teo family. Both Mr. Teo (Shucheng Chen) and his wife (Huifang Hong) are active in the local Chinese opera company, and when they’re not busy staging shows, the couple is usually at home, raising their mentally backwards son Ah Soon (Benny Soh). Welcoming their new housekeeper with open arms, the Teos nonetheless warn Rosa that she’s come at a very chaotic time, a period known as the Chinese Seventh Month, when, according to legend, the gates of hell open up, allowing the spirits of the dead to walk among the living for 30 days. The Teos have taken all the necessary precautions to protect themselves from the wandering specters (offering up prayers, burning money in the street, etc), but when Rosa inadvertently breaks the rules by sweeping up some sacrificial ashes, the young girl finds herself besieged by a number of angry ghouls, one of which stirs up a secret from the past that threatens not only her safety, but that of her employers as well. The Maid definitely has its share of spooky scenes; moments after sweeping up the ashes, Rosa is grabbed by an unknown entity and transported to a darker version of the real world, one inhabited only by spirits. Over time, she’ll also find herself face-to-face with the ghost of a teenage girl, with whom she has more in common that she realizes. Yet the various apparitions that populate The Maid are, for the most part, on the passive side, appearing often, but doing little more than making a nuisance out of themselves (the spirit of a young boy recently killed in a traffic accident has lots of fun tormenting poor Rosa). This does reduce the ghost’s overall creepiness, but, to be honest, it wasn’t the supernatural that drew me into the film, anyway. it was the story’s twists and turns, which caught me off-guard on a number of occasions (not even the narration track is as straightforward as it seems). In the end, The Maid may not be as frightening as Ju-On or The Eye, and when it comes to the Chinese legend at the heart of it all, Eduardo Sanchez’s similarly-themed 2008 movie Seventh Moon featured more threatening ghosts (in that movie, the ghouls actually hunted down the living). But with its well-rounded characters (especially Rosa and Ah Soon, who grow close to one another over the course of the film) and perplexing tale, The Maid ultimately brings more to the table than your average “J-Horror” fare.